Amazon.com description: Product Description: "The American Dream" is one of the most familiar and resonant phrases in our national lexicon, so familiar that we seldom pause to ask its origin, its history, or what it actually means. 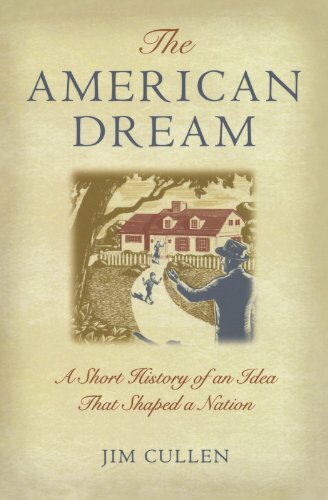 In this fascinating short history, Jim Cullen explores the meaning of the American Dream, or rather the several American Dreams that have both reflected and shaped American identity from the Pilgrims to the present. Cullen notes that the United States, unlike most other nations, defines itself not on the facts of blood, religion, language, geography, or shared history, but on a set of ideals expressed in the Declaration of Independence and consolidated in the Constitution. At the core of these ideals lies the ambiguous concept of the American Dream, a concept that for better and worse has proven to be amazingly elastic and durable for hundreds of years and across racial, class, and other demographic lines. The version of the American Dream that dominates our own time--what Cullen calls "the Dream of the Coast"--is one of personal fulfillment, of fame and fortune all the more alluring if achieved without obvious effort, which finds its most insidious expression in the culture of Hollywood. About: Traces 'the American Dreams' that have transcended history, inluding religious freedom, political freedom. About: "The American Dream" is one of the most familiar and resonant phrases in our national lexicon, so familiar that we seldom pause to ask its origin, its history, or what it actually means.